The arrival of a new North Korean Ambassador to Germany is expected to take place soon, following an announcement by state media that an official has been appointed to fill the role. According to the Korean Central News Agency (KCNA) on Monday, North Korea’s Supreme People’s Assembly (SPA) decreed that an official named Pak Nam Yong would be the new Ambassador, filling the position vacated by Ri Si Hong. NK News understands that it will indeed be Pak who will become the new Ambassador, pending any unforeseen changes to the SPA decree prior to his arrival. 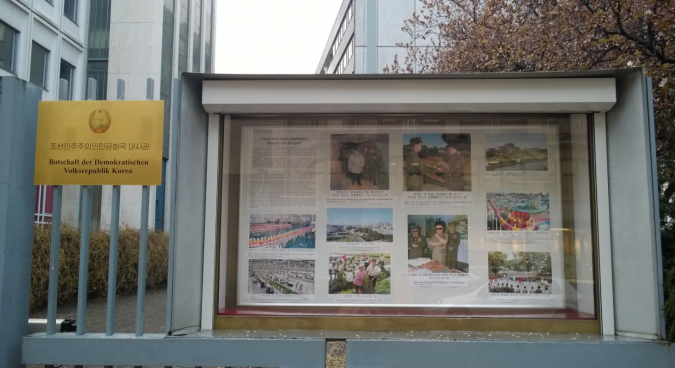 In April of 2016, a Radio Free Asia (RFA) report cited the German Federal Foreign Office as saying that Ri had left Berlin and returned to Pyongyang. Ri however subsequently returned to his post from Pyongyang after April, with RFA reporting that his nominated replacement had been rejected by the German government. South Korean media outlets reported the possible rejection as a signal that enhanced scrutiny was being applied to Ambassadorial appointees, part of an effort to pressure North Korea following its fourth underground nuclear test and subsequent satellite launch in January and February 2016. North Korea conducted a fifth underground nuclear test in September. When contacted by NK News, the Federal Foreign Office would not comment on the veracity of the reports or confirm that any rejection of a North Korean appointee had been made. Both the United States and South Korea have called on countries to downgrade or cut diplomatic ties with North Korea following the country’s actions. “This month, we instructed our embassies around the world to ask host governments to condemn the test and take further additional actions to downgrade or sever diplomatic and economic ties,” Assistant Secretary of State Daniel Russel said during a Senate hearing in September. It also included other limitations over the bank accounts allowed to be opened by accredited diplomats and their missions in foreign countries. North Korea has operated an embassy in Berlin since 2001, according to the Federal Foreign Office website.